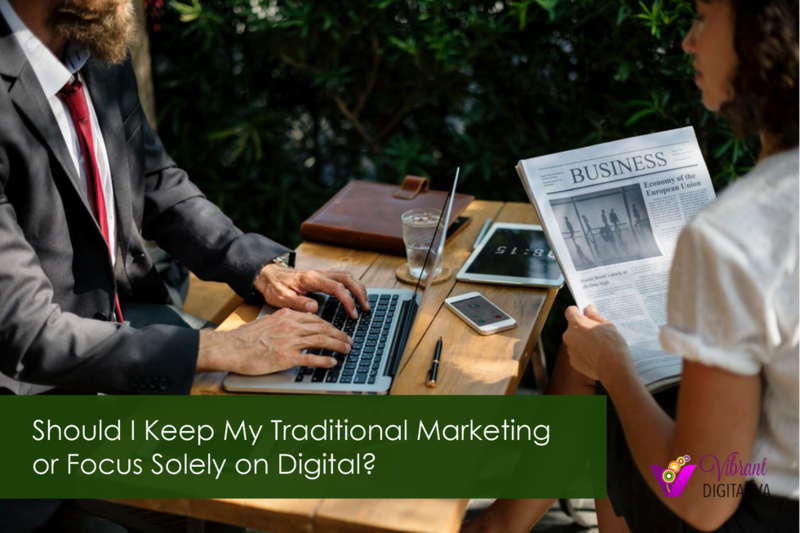 Should I Keep my Traditional Marketing or Focus Solely on Digital Marketing? Should you keep your traditional marketing tactics or focus solely on digital marketing? The answer is - it depends on your company, your industry and your budget. Most small and midsized businesses need to be selective and not spread themselves too thin. You really have to focus strategically on avenues that will give you the most bang for your buck. The key is to develop a marketing strategy first and then determine which channels will best enable you to meet your goals. Digital marketing can be very effective, but what can be even more effective is to incorporate some of the traditional methods into a complete marketing plan to get a well-rounded approach to building brand awareness. Traditional marketing has always been an effective method for first establishing your brand in the marketplace; a digital strategy with regular updates will help you engage your customers and keep them coming back. In today's online environment, especially with the prevalent use of mobile devices like smartphones and tablets, businesses use a variety of digital marketing creative assets and digital marketing tactics to expand their customer base. Traditional marketing methods are very effective at brand awareness and bringing in potential customers in a burst of short-term activity. Most traditional print marketing tactics are one-time blasts that work for a short time. Television and radio spots are great for a burst of activity that ends when the advertising is no longer running. Digital marketing is a longer-term approach. Getting found by search engines, getting your content seen by potential customers, having a website, blog, email marketing campaign and an ongoing social media campaign are strategies that become long-term assets for your business. Incorporating innovative digital marketing with traditional marketing methods is the most effective way small, local businesses can supplement their current marketing campaigns. For example, if you have print, television or radio advertising efforts happening, promote your online marketing - like your website, blog and social media accounts - and advertise special offers to increase your online presence and leverage your traditional marketing campaigns. What marketing methods have been the most effective for your business in the past? What methods are you considering for your future marketing plan?